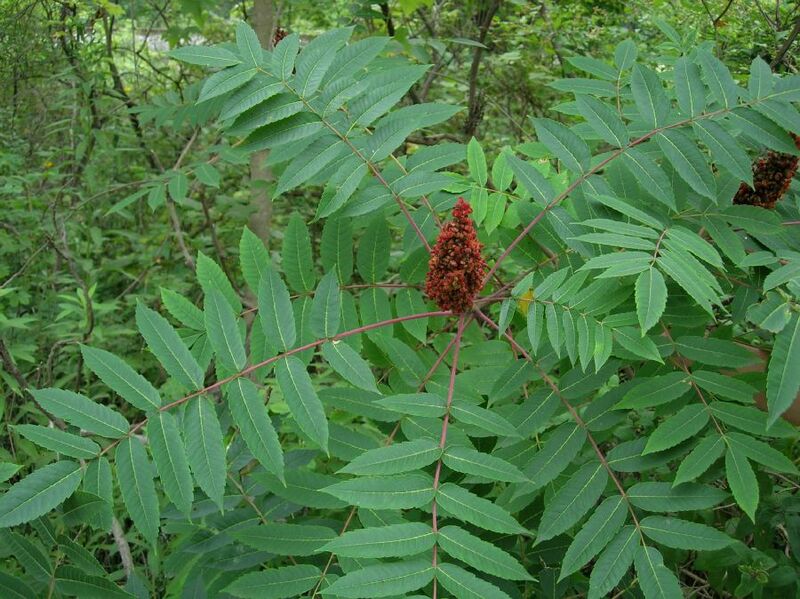 Rhus glabra.Copyright © 2006 by Robbin Moran.www.plantsystematics.org (Accessed 7/2014). 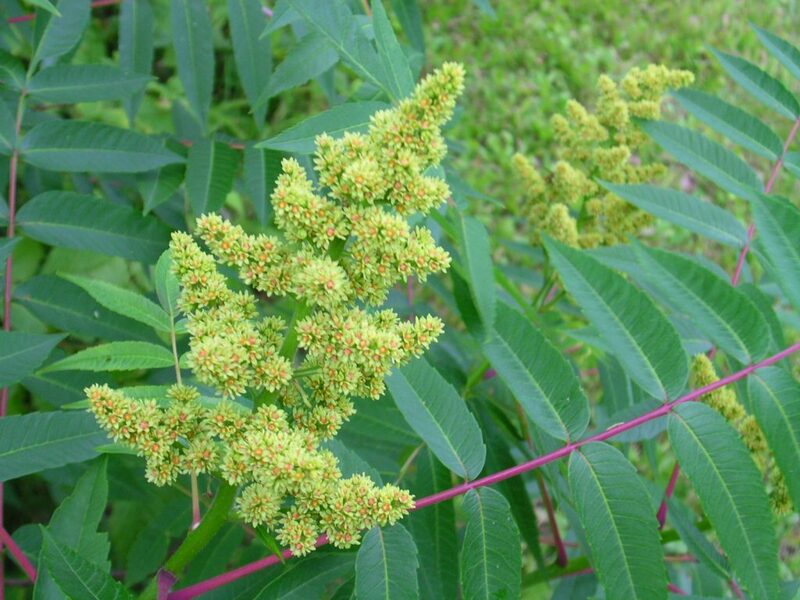 Rhus glabra is a shrub or small tree to 6 m tall, colonial from root sprouts, sparsely branched, twigs stout, hairless, new growth pale green to purplish with waxy bloom, older stems tan-brown. Rhus glabra flowers commons.wikimedia.org (Accessd 5/2017). Leaves alternate, pinnate, leaflets 11-31, to 10 cm long, pale below, hairless, margin toothed, leaves expand in early May; autumn color red-orange; winter plants leafless180 days (Britton 1874). Flowers tiny, greenish in dense, branched, pyramid-shaped clusters to 20 cm, at ends of stems, sexes on separate plants (clones), blooms July-Aug. often in fruit when R. copallina is in bloom, visited by bumble bees and honey bees (personal observation). 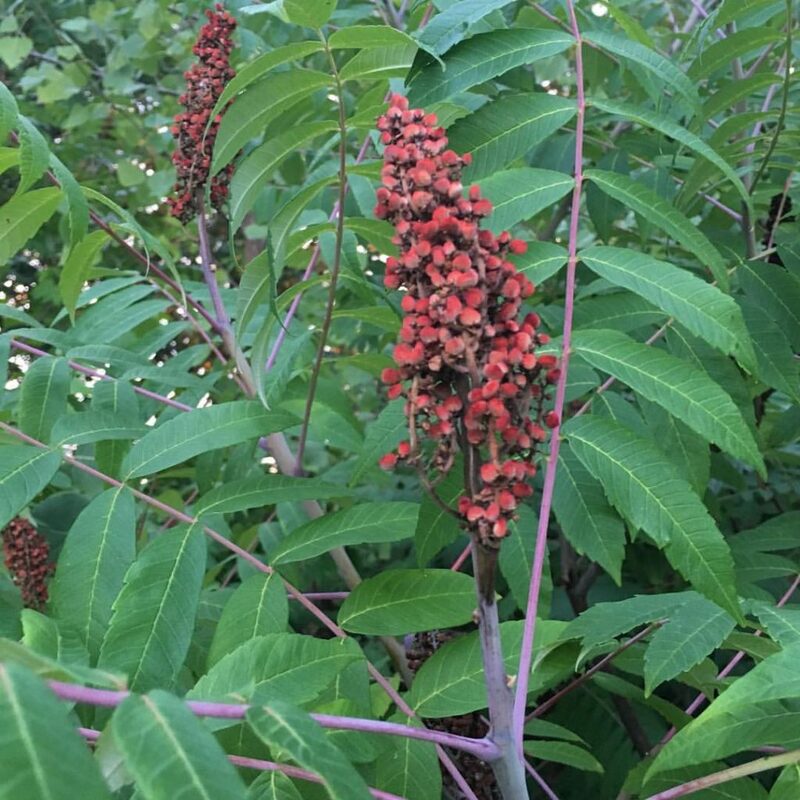 Rhus glabra (smooth sumac).Richard Barry.8/1/2016 (Accessed 8/21/2016). Fruit velvety, bright red, about 5 mm, 1-seeded, in a dense, conical head, S-O, very persistent. Seed load 48%. Pulp nutrients: water 11%, lipid 13%, protein 2%, CHO 2% (White 1989). Available for winter resident birds. Fruit eaten when other food unavailable. Habitat: Open areas, woody pioneer, very shade intolerant. Growth rate 2.97 (relative to 9.24 for B. populifolia and 0.99 for sugar maple). Growth rate was found to correlate well with relative shade tolerance (Grime 1965). Quickly shaded out by taller species in developing woodlands. Rich soils, fill, pH 5.3-7.5 (USDA, NRCS 2010). Tolerant of salt, drought. Intolerant of soil compaction, flooding, shade, index 0-2 (Hightshoe 1988). Notes: Twigs and bark eaten by deer and rabbits (Martin et al 1951). Not as common on poor soils as R. copallina. May be attacked by Calophya flavida (Homoptera, Psyllidae) sucking insects (plant lice) related to whiteflies and scale. They occasionally bite humans also. The overwintering nymphs are flat, dark, scale-like, with a tiny fringe of white filaments (Johnson and Lyon 1991).